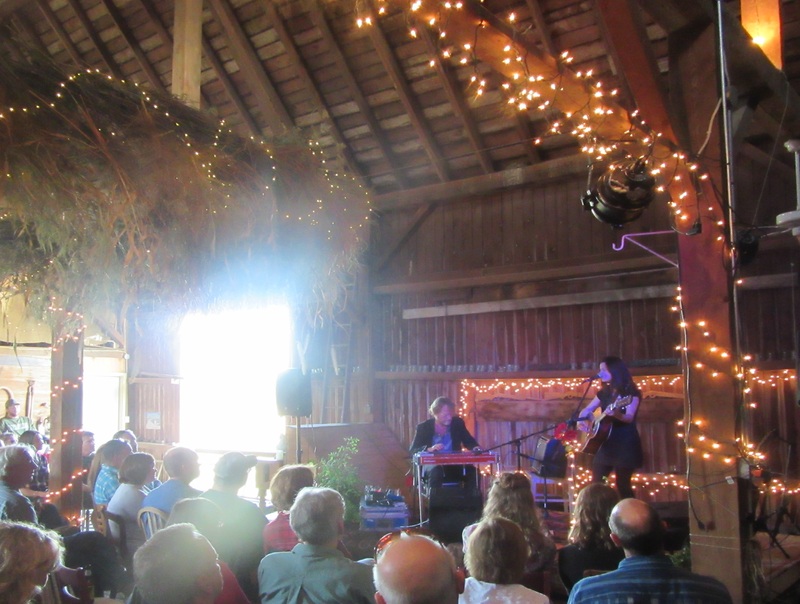 Singer-songwriter Caitlin Canty and pedal steel player and guitarist Eric Heywood perform beside the still-strong sunlight of early evening and below the “field halo” at Three Brothers Farm, outside of Oconomowoc, Wisconsin. And by concert time, the sun had burned off the rain from the early morning, and overcast clouds had fled. But sunlight couldn’t chase away the rue of my gal pal, Ann Peterson, who was unable to come to what she describes as “the most romantic place I can think of” for a concert. She was babysitting for her very first grandchild, so I took in the show with my friend Steve Hackbarth, an assistant professor of English at Milwaukee Lutheran College, who lives nearby in Oconomowoc. Besides being a Medieval and Renaissance literature scholar, Steve is an acute appreciator of well-crafted song storytelling lyrics and vernacular-music style which, among its various roots, can be traceable to Medieval plainsong. 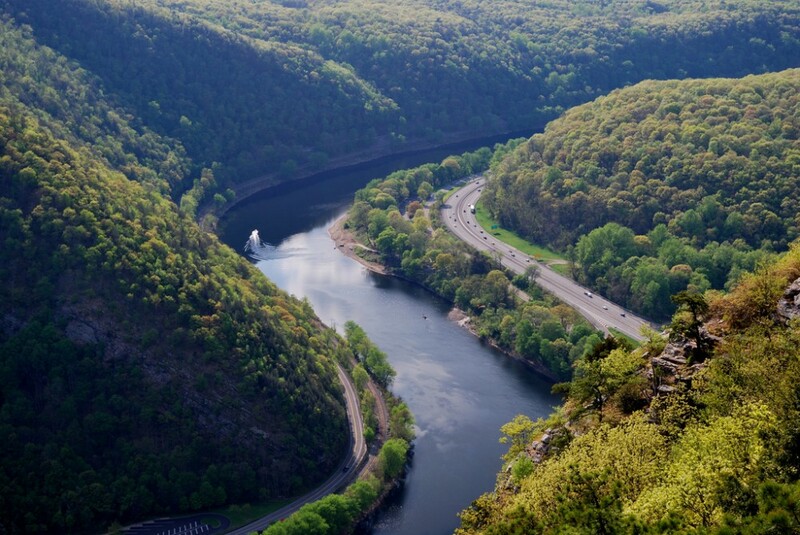 A cantor like Caitlin knows how to craft a story, whether in the artful form of a song or a confessional anecdote, clearly inspired by this very special place. Three Brothers helped facilitated her musical relationship with The Punch Brothers, which includes mandolinist and singer Chris Thile, now the host of the beloved NPR radio program A Prairie Home Companion. The Punch Brothers were performing at Milwaukee’s Summerfest a few years back, when they got wind of her playing not too far away at Three Brothers, near Oconomowoc, Wisconsin. Punch Brother Noam Pickelny found time to come to see her and sat in with her at the enchanted venue. 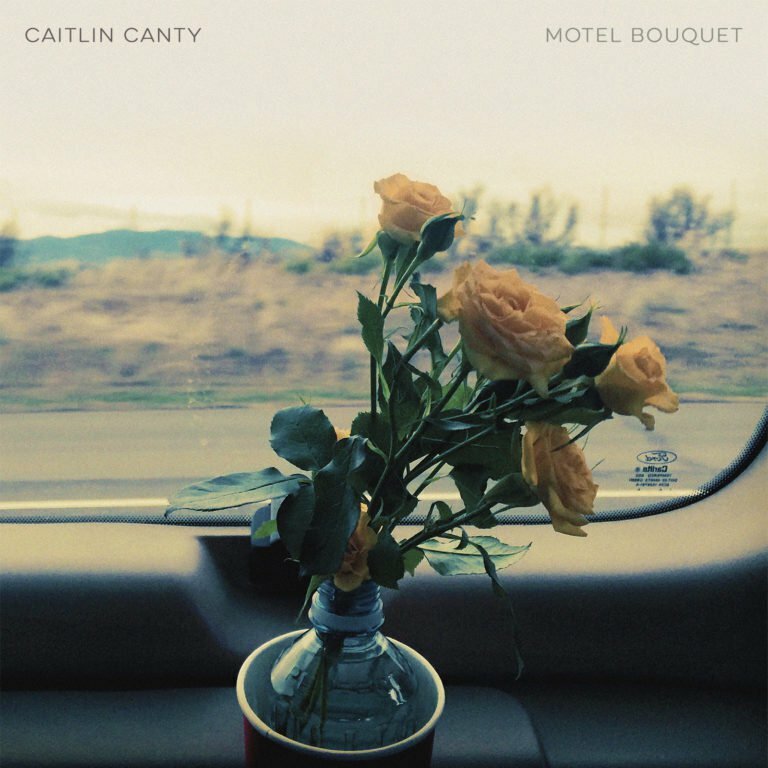 If he or the Punch Brothers fell under a Three Brothers spell, it has continued and enhanced Canty’s evocative artistic endeavors on her latest album Motel Bouquet. One thing led to the next and Pickelny ended up playing lead guitars and banjo, co-writing several of the songs with Canty, and producing the album. Two fellow Punch Brothers also assist on the album: Paul Kowert plays upright bass and, on two tracks, Gabe Witcher plays fiddle. These were reasons why this was her favorite place to play, perhaps a romantic exaggeration. 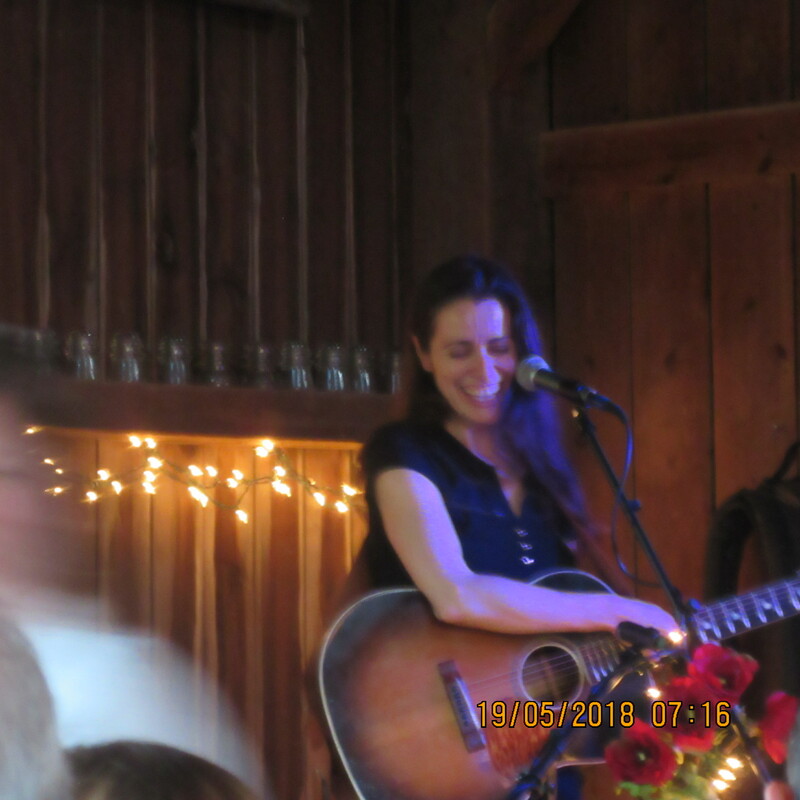 “But I normally play in small, dark clubs that smell like year-old beer on the floor,” she explained, as a gentle breeze, sunlight and rustic aromas filled the barn. She also marveled at what she calls the “field halo,” a large, ingenious circular construction of grain grasses bedecked in festive lights, which hovers over the space in front of the stage. (see photo at top). It felt almost like the golden ghost of a hoary, prehistoric buffalo that might’ve once wandered wild in these parts. Meanwhile, the farm’s pet dog wandered eagerly among the seated guests, sniffing for droppings of the delicious stone oven-fired pizza they sell at concerts. But her primary offering was Motel Bouquet, and this felt like an ideal setting to share the complex aspects of romance entailed in the album’s songs. Which brings us to the music. Her performance consisted primarily of material from Motel Bouquet, which trafficks in plenty of romance but in no simple or facile terms. The cover image conveys the transitory nature of life on the road for a touring musician, and such a person’s romantic prospects. A photograph of a bouquet of vased roses appears to sit on the table of a moving bus or a train, an unsteady situation in itself. 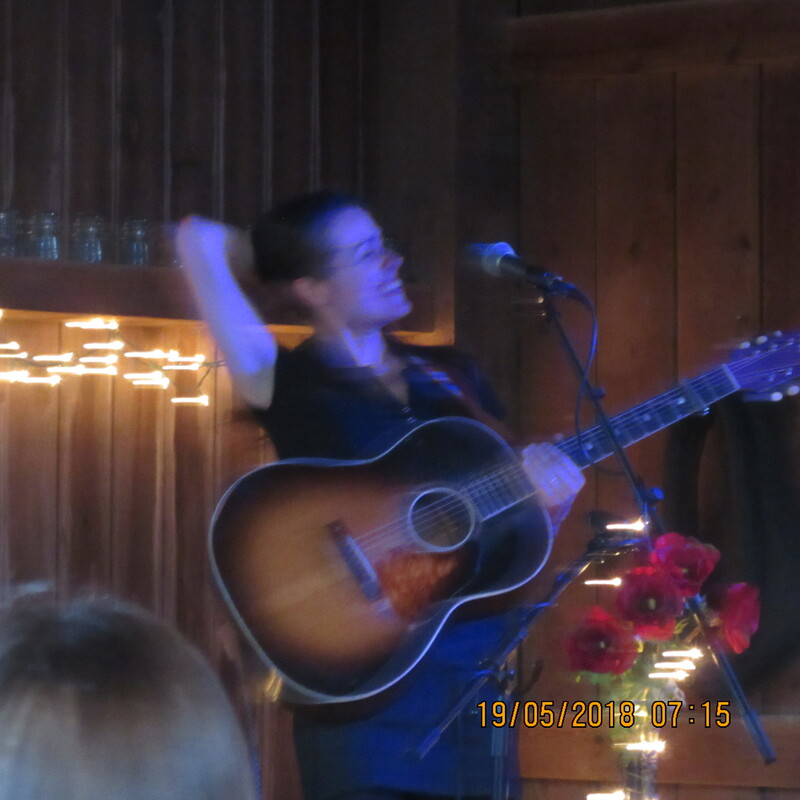 At Three Brothers, a similar bouquet of short-lived roses sat right before her microphone, as Canty performed (see photo below). 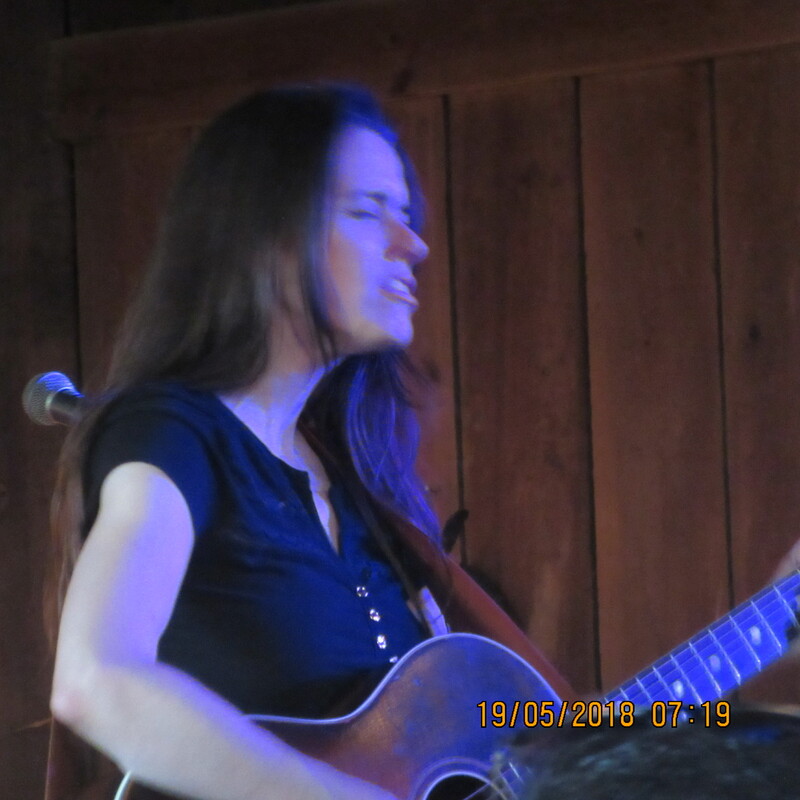 With the extremely able backdrop of Eric Heywood’s pedal steel guitar, she meandered through the album, almost inverting the song order in a sort of shuffle sequence, like rose petals blown backwards, falling into a trail of memories. The album’s penultimate song, the country twanger “Basil Gone to Blossom,” a metaphor for short-lived romance, came early. And the album opener, “Take Me for a Ride,” closed her concert’s set list. Her voice is effectively expressive – especially with the sort of swallow-a-word emotional quaver, and the wistful, high-pitched sigh in a phrase: “You-hoo-hoo take me for a ride,” – that disarms the listener, while arming her against further deceit. She rightly claims the centerpiece of the album is a remarkably spare, almost existential questioning song, “Who.” She had considered it for the album’s title, although she jokingly noted that it would have implied the question mark: ‘Caitlin Canty Who?” Here, her voice seems engulfed in a cloud of uncertainty, hanging low like a haunting. Perhaps this pregnantly hollow scene left Canty fleeing to Motel Bouquet. 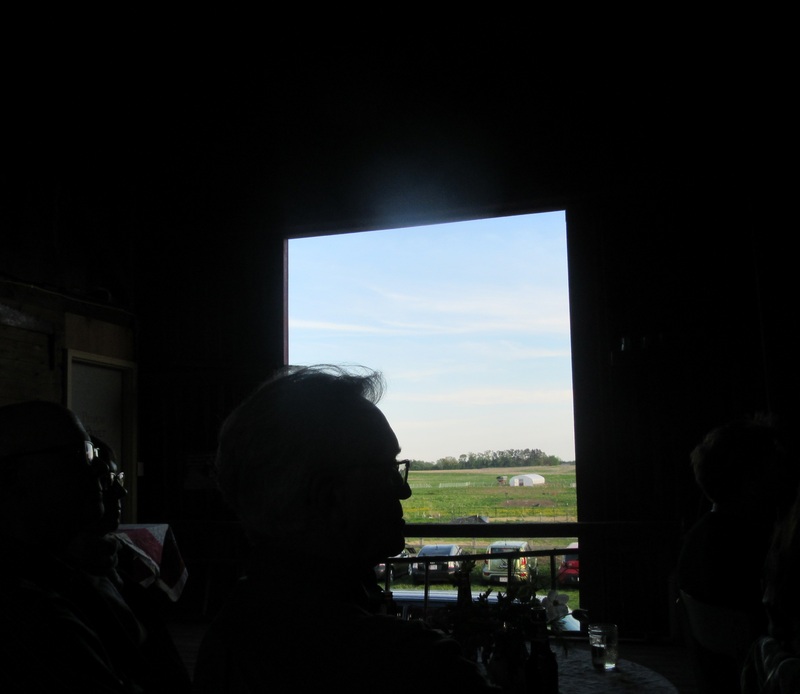 But this night the troubadour had found a high, embracing barn roof, blessed with long shafts of sunlight, beneath a room full affectionate and engaged listeners. And to the degree such songwriting may be confessional, we can only give thanks she’s finally found a room in a home with a fiddler who can pluck her strings, and stay right beside the fire in her heart. 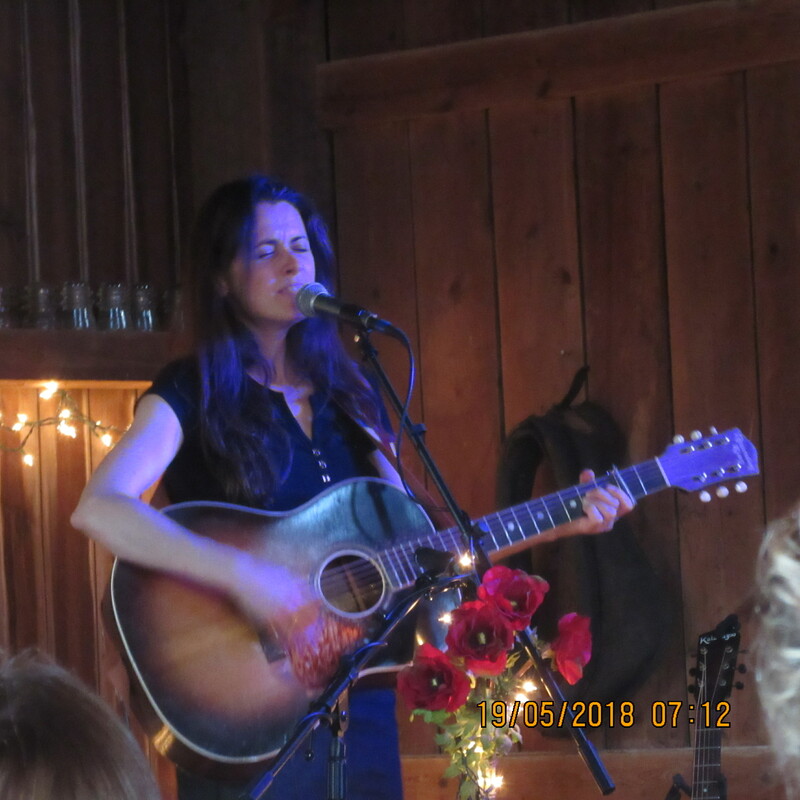 Several notable singer-songwriters lingered in the crowd, including Peter Mulvey and Hayward Williams, who came up to sing harmony with Canty on a cover of Neil Young’s “She Rides a Harley Davidson,” a perfect love ode for a Milwaukee-area crowd. Totally struck by a night that was so “sparkly and beautiful,” Canty changed her final encore to a waltz. The sauntering 3/4 time of “Tennessee Waltz” allowed sparkle into the tempo and the sadness, as she firmed up her tough romantic’s bonafides. The seminal country refrain provided fuel aplenty to roll on down the road, to a blinking-light in the fog, and a low-slung place in the dark, for her to lay her head. I left for home with a copy of Motel Bouquet, enchanted memories, and a dozen of the farm’s pasture-raised eggs.